Got to play Street Fighter IV the other day. I found it at the Narrow’s Bowling Alley in Tacoma, WA, in case anyone is interested. It was pretty fun. 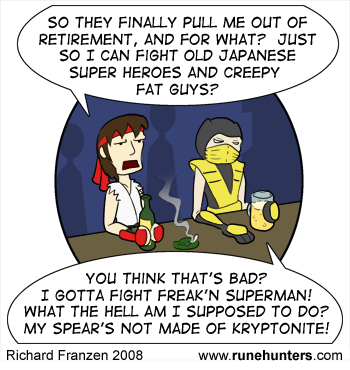 Not much to say about this one, other than it is about Scorpion and Ryu in a bar, catching up over a beer. Ryu is talking about Tatsunoko vs. Capcom and SFIV’s Rufus. Scorpion is talking about his appearance in Mortal Kombat vs. DC Universe.